As he lay on his deathbed on August 9, 1948, Babe Ruth penned a shaky, misspelled autograph on what would become his last will and testament. He wrote “Georgge Herman Ruth” along the signature line of the document and then crossed out the extra “g” in his rarely used first name, George. To baseball fans the world over he was known famously as the “Babe,” but for lawyers and witnesses preparing for his inevitable demise brought on by the ravages of cancer, his legal name was required on the document that would be filed in the NY Surrogates Court. It was an important document that would be utilized to divvy up his estate between family members and even the Baseball Hall of Fame. Babe Ruth may have signed a million autographs for fans during his lifetime, but this signature was, perhaps, his last. Today, over a half century after his death, the Babe’s authentic signature commands tens of thousands of dollars at auction and is coveted by collectors young and old. A website called “Signofthetimes.com” offers photocopies of Ruth’s 1948 will for $21.00. The site also states that, “The original is also available, for a slightly higher price: $95,000. So it’s no surprise that the signature on the Bambino’s last will and testament may have been nighthawked by someone with larcenous intentions. Strangely enough, the Babe’s 1948 will was the subject of a 2001 New York Times article written by reporter Richard Sandomir. Sandomir discovered that New York auction house Leland’s was auctioning off what was purported to be Babe Ruth’s last will and testament dated from 1938 and that a collector from Centereach, NY, named Mark Lewis, was claiming that he had Ruth’s true last will and testament dated as of August 9, 1948. Said Lewis in the Times article, “What they are doing is wrong, and it’s besmirching the will that I have.” Sandomir described the 1938 copy as a “superseded will,” but nowhere in the article was it questioned as to how any individual could actually own someone’s last will and testament, let alone the Bambino’s. Babe Ruth's shaky and misppelled signature from his Aug. 9, 1948 last will and testament. As for previous drafts of wills like the 1938 copy of Ruth’s will sold by Leland’s, Nass also confirmed that “it is possible for a litigant to have original documents returned to him or her by the court after litigation has concluded.” The 1938 copy sold by Leland’s was stamped by the Surrogates Court as an exhibit in a 1952 court proceeding in which Ruth’s daughter, Dorothy, contested the 1948 will. While it is possible that the 1938 Ruth will could also have been swiped from the probate file, it would be difficult to prove. Claire, and the cover of the 1938 will has an ink inscription reading, “Mrs. Ruth’s.” Both Halper and Ruth’s widow are now deceased, so there’s no way to know for sure. 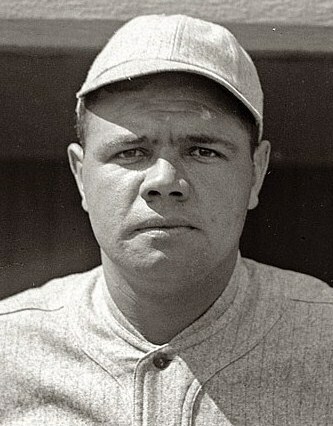 Recent investigations conducted by Haulsofshame.com have shown that Halper’s collection included many items stolen from institutions, however, it seems likely that the closest a collector could get to owning a Babe Ruth will is by acquiring the 1938 copy. So how did collector Mark Lewis come into possession of the “Sultan of Swat’s” famous 1948 will? This copy of Babe Ruth's will belonged to his daughter, Dorothy. It has no signatures and is marked "Compared with certified copy 9/9/48 J.O.C." When contacted at his Mark Lewis Tax Grievance Company in Centereach, Long Island. Lewis confirmed that he still owns the 1948 Ruth will, and that he sold the majority of his Babe Ruth items in several auctions, including Sotheby’s in 2004. Lewis stated that the 1948 Ruth will was scheduled for auction in the 2004 Sotheby’s sale, but indicated that before the auction New York State officials had contacted him to recover the will. Kim Sulik, Archivist of the NY Surrogates Court confirmed that Ruth’s missing will was reported to officials in 2004, but was not aware of the status of any investigation or litigation. Calls to the office of the New York Attorney General were not returned. “Steve,” the dealer also writes, “The original is also available, for a slightly higher price- $95,000.” Valuing his 1948 Ruth will in the six-figure range means that Lewis is unlikely to hand over the document without putting up a fight. Lewis, a long-time Met fan, fought successfully against his favorite team to keep another controversial baseball item he owns. In June of 2000, Lewis consigned a 12-by-17-foot New York Mets 1986 World Championship banner to Grey Flannel Auctions, only to have the New York Mets claim that the banner was stolen in 1987. The Mets called the police and the banner was confiscated by the police and subsequently returned to the Mets, all without contacting Lewis, who was out of the country at the time. Lewis sued in Queens civil court, and won, regaining possession of the 1986 banner he said he’d purchased from a member of the Mets grounds crew. The banner now hangs in Lewis’ Centereach office. When it comes to the Bambino’s will, Lewis is unlikely to have the same success he had with the 1986 Mets banner. The New York office of the Federal Bureau of Investigation confirmed that agents are investigating the situation and have already contacted at least one member of the Ruth family and the players involved in the controversy. The FBI is presently in the midst of a year-old investigation involving similar thefts of historic baseball materials from the collections of the New York Public Library. The FBI was also involved in a major 1998 investigation into the thefts of the last wills and testaments of Baseball Hall of Famers by a Boston court probation officer named Joe Schnabel. In May of 1999, USAToday reported that Schnabel “pleaded guilty to stealing two wills signed by Baseball Hall of Famers and selling them for more than $15,000.” Schnabel pilfered documents from the Boston courthouse but apparently travelled to other courthouses around the country as well. 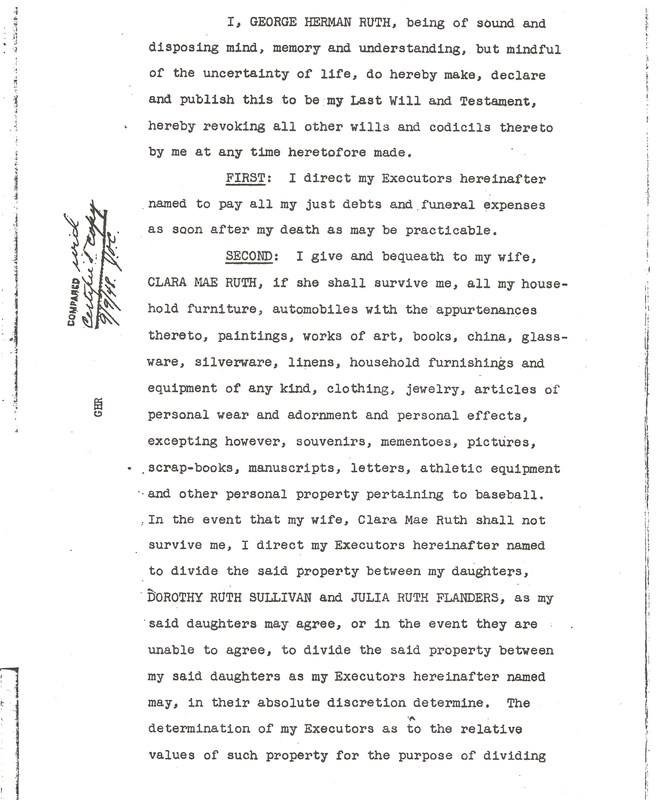 A source familiar with the Schnabel investigation recalls an interview he had with a Boston Police detective who indicated that Schnabel “admitted to (stealing) seventeen wills.” Notes from that interview indicate that the wills of Jackie Robinson and Babe Ruth were included on the list of Schnabel’s seventeen stolen wills. Another document Schnabel stole, signed by Hall of Famer George Wright, appeared for sale on baseball autograph dealer Kevin Keating’s website just last month. Numerous wills that Schnabel admitted to swiping have never been returned and are still missing from the files of courthouses all over the country. Back in 1999, Schnabel pleaded to only two counts of larceny and was sentenced to one year of probation with a fine of $5,000. The FBI is currently investigating whether the Ruth will and others were tied to the Schnabel case in Boston and where all of the missing wills have vanished to. Just last week, three Connecticut probate courts confirmed that the wills of Hall of Famers Jackie Robinson, James “Orator” O’Rourke and nineteenth century slugger Roger Connor were missing from court files. 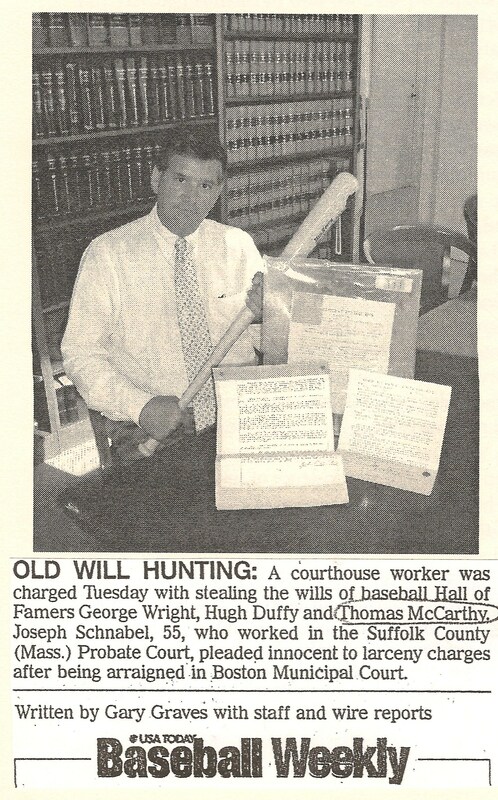 Rich Iannella, the Suffolk County register of probate, pictured with the recovered will and legal documents of George Wright in 1999 (Top). News clipping from USATODAY's Baseball Weekly on Feb. 10, 1999 regarding the stolen Hall of Famer wills (Bottom). The attorney who drafted the Babe’s 1948 will was named Melvin G. Lowenstein, who along with co-executor Paul Carey II was in charge of the Ruth estate and its distribution to family members and charities included in the Yankee slugger‘s final wishes. 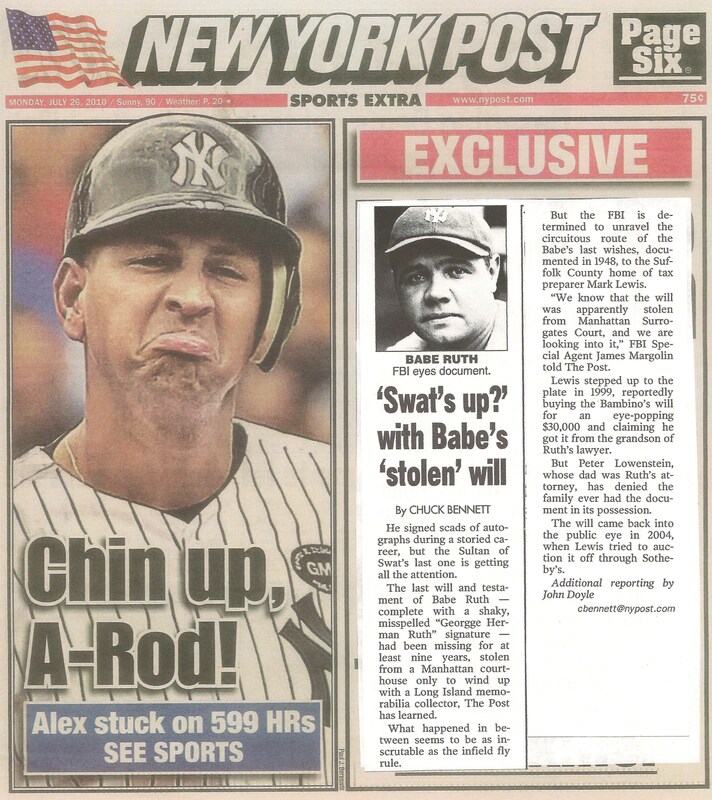 New York Post article published July 26th, regarding the controversy over Babe Ruth's will. This article the result of a lot of good research. I hope Iannella finds everything that has been stolen and puts the culprits in jail. keep up the reporting…an informed public … will help stem the tide of theft and return these treasures to where they belong. How much stuff out there could actually be stolen. This seems to never end. Stealing wills is akin to robbing someone’s grave- shameful. I cannot wait till the day these items find their way home! How can these people live or have lived with themselves knowing they have so dishonored someone’s memory?